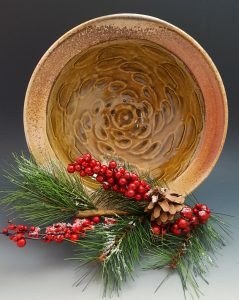 You are invited to join me for our annual Holiday Pottery Sale. My pottery makes a perfect gift for even the toughest person on your shopping list. You’ll find pottery for the table intended to be used every day, vases, containers, decorative pieces and hundreds of ornaments. Guest artist Linda Quimby will also be showing her work during this event. In addition to her beautiful fluid epoxy resin paintings, Linda will have colorful functional pieces like cutting boards, wine stoppers and pendants.